Crispy Baked Honey Chipotle Chicken Wings. Super easy to make and healthier than fried. Tossed in a sweet and spicy Honey Chipotle sauce! Confession: I love chicken wings. Especially wings that are super crispy and dripping with lots of sauce. The sauce has to be super spicy and accompanied by ranch dressing for dipping. When I order wings out at a restaurant I always get naked wings extra crispy and the sauce on the side. This ensures my wings are always super crispy and I can load them up with as much sauce as I like. I baked these chicken wings in the oven instead of frying them. It saves some calories and you still get a super crispy chicken wing. These wings are surprisingly easy to make. I like to make the Honey Chipotle sauce while the chicken is cooking and toss everything together once the chicken is out of the oven. I start by dabbing the chicken wings with a paper towel to ensure they are completely dry. I then place them on a wire rack on top of a baking sheet. This makes the chicken extra crispy by allowing the extra grease to drip down onto the baking sheet. The wings cook in a 400 degree oven for 40-45 minutes until cooked through. I then place them under the broiler for an additional 2-4 minutes to crisp up even more. Now let’s talk about the sauce. It’s sweet and spicy and smothered on top of the wings. The sauce is made up of honey, chiles in adobo, ketchup, vinegar and butter. You can control the amount of heat by adding more chiles in adobo for spicier wings or more honey to sweeten it up. To me the chilies in adobo make the sauce. I like to add about 1-2 tablespoons more when I am making this for myself. I love the smokey flavor and spiciness. You can find chilies in adobo in your grocery store in the Mexican isle. 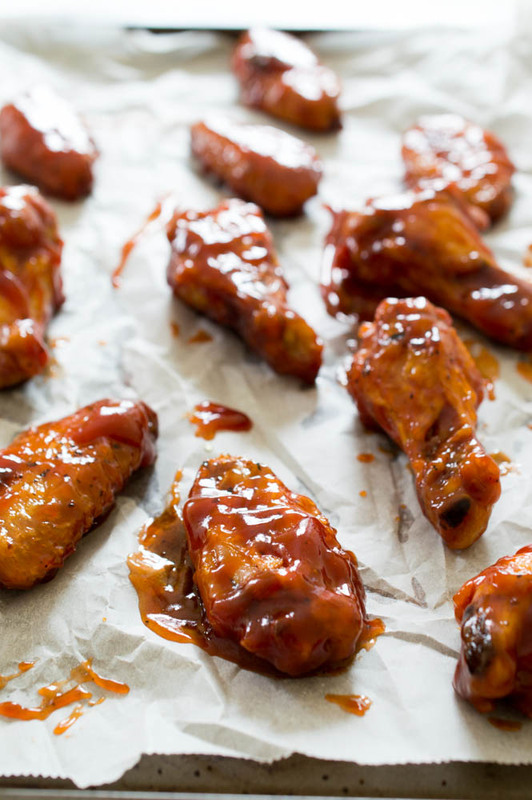 These Crispy Baked Honey Chipotle Chicken Wings are a perfect snack or appetizer. Grab some napkins and enjoy these Crispy Baked Honey Chipotle Chicken Wings! 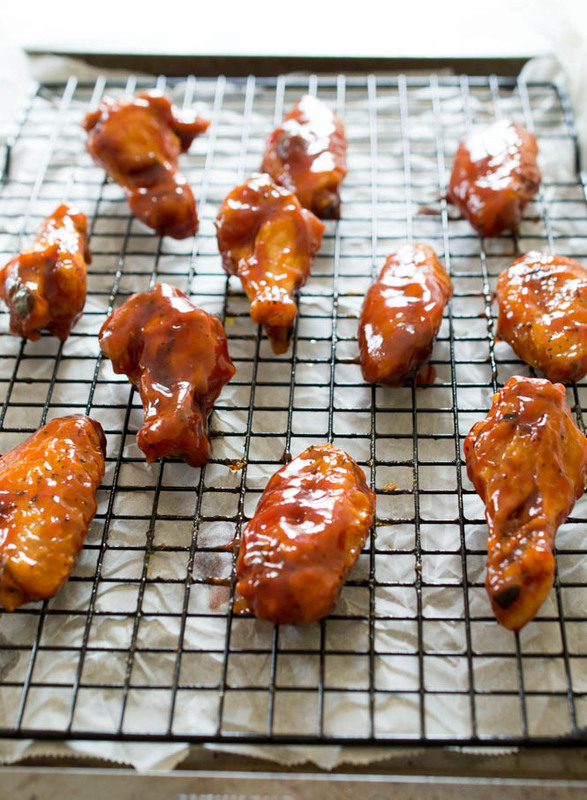 Love these Crispy Baked Honey Chipotle Chicken Wings? Here are some more appetizers you’ll love! Dab the chicken wings off with a paper towel to ensure they are completely dry. 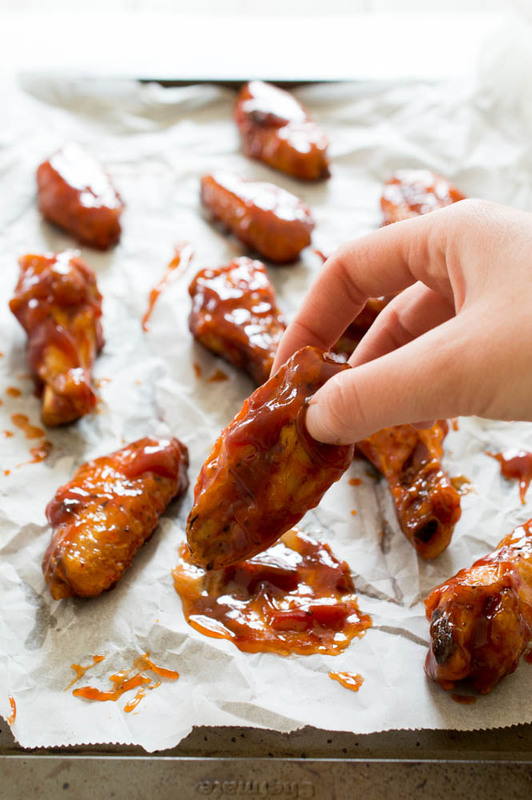 Place chicken wings on a wire rack on top of a baking sheet. Place them in the oven and cook for 40-45 minutes until cooked through. Keep the chicken in the oven and turn the broiler on. Broil chicken for 2-4 minutes (or longer depending on how crispy you like your wings). Keep a very close eye on them. Meanwhile, add honey, chilies in adobo, butter, ketchup and apple cider vinegar to a small saucepan. Cook for 2-3 minutes until butter is melted. Keep on low heat until ready to toss with wings. Immediately after wings are done cooking toss them in the Honey Chipotle sauce. Serve immediately with ranch or blue cheese dressing. Chicken wings covered in sauce are my favorite, too! This honey chipotle version sounds fantastic, Kelley! I love how easy these cuties are to whip up, too. Looks like the perfect snack! This sounds delicious Kelley! Also- how did I not know you could order naked wings extra crispy with sauce on the side? You’ve introduced me to a whole new world of crispy saucy wing goodness!! I love crispy wings covered is sauce also! I worked in a wing place for several years when I was younger and became very spoiled. I ate wings almost every day, haha. The honey chipotle sounds so good and I love that these are baked! Wow! These wings look seriously amazing!! My husband is obsessed with chicken wings especially when they’re piled on with sauce. 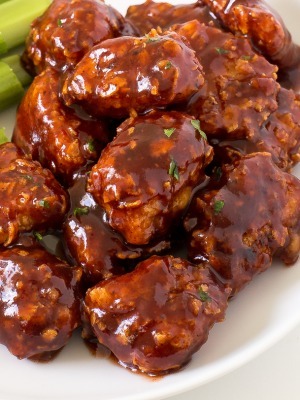 Love the honey chipotle sauce, it sounds finger lickin’ good! There is nothing better than saucy chicken wings – love this combination! Can I get an order of those wings with a icy cold beer? Yum! 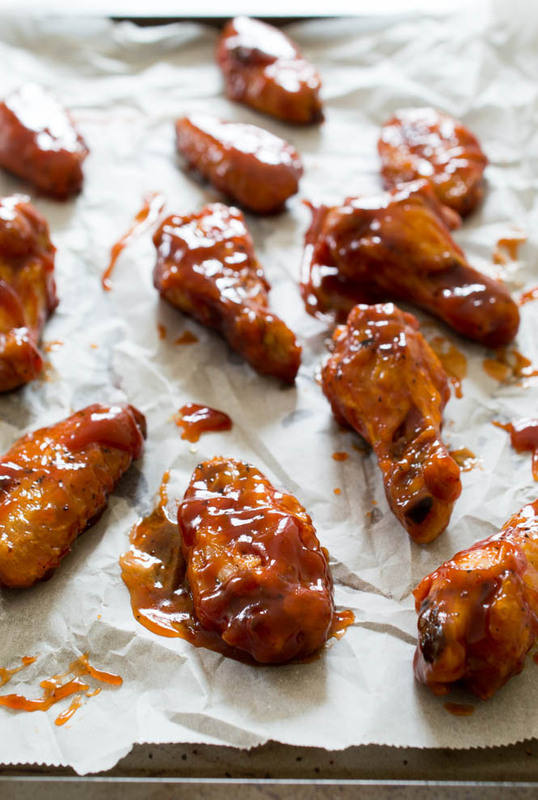 Chicken wings are NOTHING without good sauce….and this is better than good. I love the spicy sweetness! These look so yum!. 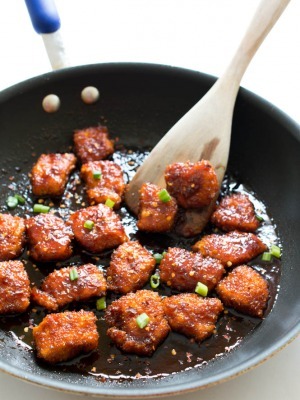 I love sticky chicken and I can’t believe I have never tried making it. Might need to give these a try soon. I am so happy to see that you baked these! It is so easy and soo much healthier! 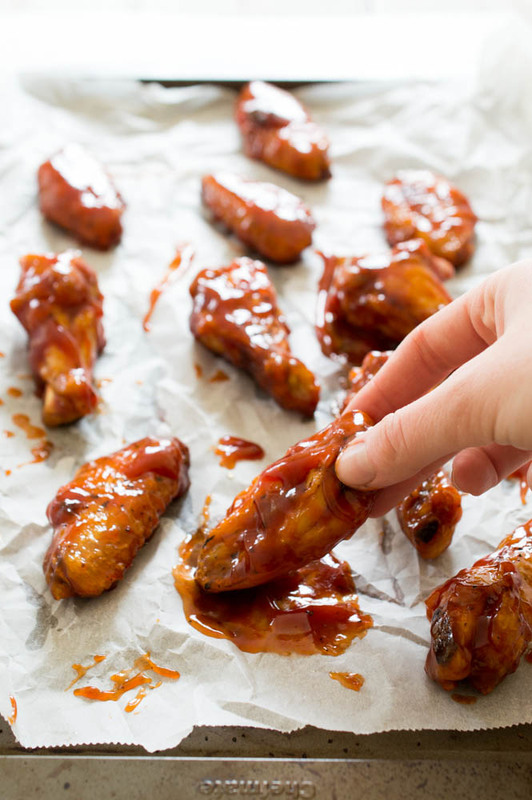 The sauce on these chicken wings looks so oooey, gooey and delicious!! I bet these wings are super flavorful and delicious! This is seriously something I can get on board with. I am obsessed with anything with chipotle on it. This glaze was really good! I only had hot Hungarian paprika, so I used significantly less adobo to help with the heat (I was feeding kiddos), but it was excellent! Even the kids loved it. I’m going to try on the grill next time. I’m so glad you and yours enjoyed them. I love the smokiness grilling lends to wings!